This summer we celebrated five years in our current home, the longest Ghostwriterdaddy and I have ever lived in one house together. This is the house that we brought the preschooler and the baby home to, and the house I coveted like a crazy woman when The Big One was first born. This is the house I always thought I would grow old in. You can see from the pictures above that the room was pretty unloved, sadly. The walls were bare and the toys were out of hand. We do have cute kids though! I decided early on that I wanted colours. No more off white walls. I wanted yellow and grey. I wanted patterns. I did not want to be swayed on this! The feature wall is opposite the windows, which look out onto the front garden and the road beyond that. This wall was also home to the TV but we decided we wanted to completely change the room around. We moved the sofas clockwise and popped the TV on the wall opposite the door to the room, exposing our feature wall as a huge blank canvas. We bought some Art House wallpaper in Opera from B&Q (I can’t find it online, sorry!) and hung that on our wall. We also used our voucher to buy a tin of Dulux matt emulsion in warm pewter for the other walls. Immediately our room was transformed. We need new carpets! Until then, our new rug, again from B&Q, in dark charcoal hides a multitude of child induced sins. On top of that we have the best coffee table ever- a den and a slide in one! What more could you ask for? We have lights from our Christmas tree right now, but the effects of the yellow in the wallpaper and the soft, warm grey really brightens the room. We do have a couple of large floor lamps that work well towards the cosy effect of the room too. The room is certainly more cosy. The warm grey is almost soothing and the retro print of the feature wall adds a quirly edge to the room that is so much more us! I don’t know how I put up with such a bare room for so long! We have a dresser that we bought a few years ago which has different colours draws and different handles and knobs on it. We love that dresser and it reflects a lot of the ways in which we approach things in life. It doesn’t really match, but it works really well. So what do you think? We love this room so much now- it has so much more personality and it’s more than ready for Christmas morning now! This post is our entry into the competition. We were sent £50 B&Q vouchers to use for this purpose. Next Post Salt dough Christmas! Thank you- it really is a transformation isn’t it? Ah thank you! Such a change isn’t it? Danielle Askins recently posted..Gingerbread house-fail! Love it! Funky, fun and functional for a fabulous family! It looks really cosy and modern. Where is the tv cabinet from? Good news, albeit late. I’ve tracked down the wallpaper if anyone stumbles across this and is still interested. 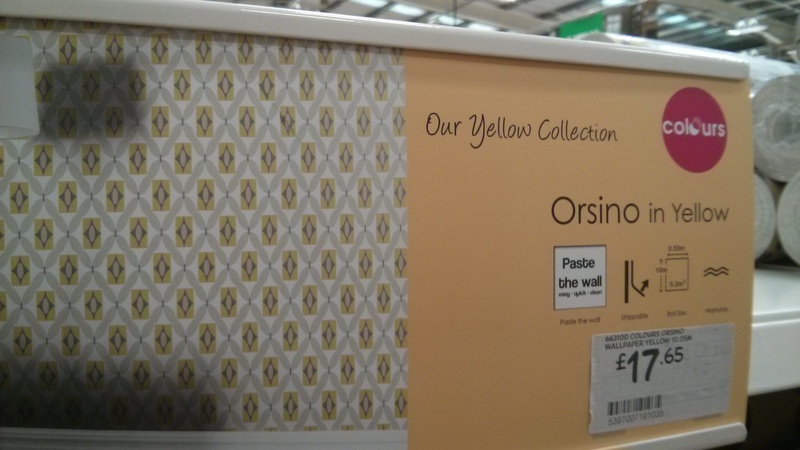 According to my local B&Q it’s called “Orsino” and it’s their own brand rather than Art House.